Welcome to the University of Wyoming's Office of Water Programs. 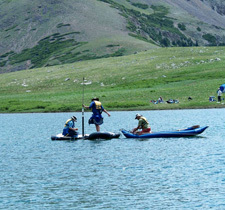 The University of Wyoming's Office of Water Programs (OWP), created in 2002 by the fifty-sixth Legislature of the State of Wyoming, is charged with identifying research needs of State and Federal agencies regarding Wyoming's water resources and serving as a point of coordination to encourage water-related research activities by the University of Wyoming. The OWP works in conjunction with and reports to the Wyoming Water Development Commission (WWDC) and the Select Water Committee and provides the University's advisor to the Wyoming Water Development Commission. The Office of Water Programs administers the Wyoming Water Research Program (WRP), including activities under the National Institutes of Water Resources (NIWR). The WRP is a cooperative Federal, State, and University effort. A more detailed description of the WRP is available under the About the WRP link. Researchers collect data in the Never Summer Mountains.